Risen Spirit just ran (unplaced) in the first at Tampa Bay Downs, 7F $8k maiden claimer. Caught my eye due to his white- flaxen coloring that extended to the mane, making him look almost palomino. Anyone else ever seen this animal? He looks like the great sprinter, Apache Cat. Wonder if they're related? BaroqueAgain1 wrote: He looks like the great sprinter, Apache Cat. Wonder if they're related? I didn't even notice the spots when I watched the race...probably thought they were just kickback from the muddy track. 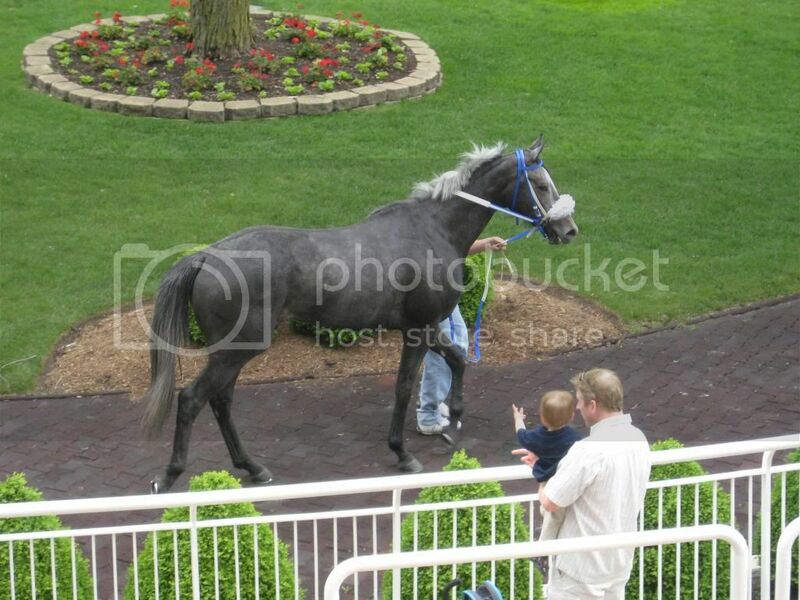 They're much clearer on the Bloodhorse pix...thanks for the link. Odd, I don't remember seeing those spots in the post parade either hah. Thought I would add pictures of my colt to this thread, he came out with lots of white ticking throughout his coat! What a handsome fellow, BC. You must be very pleased. And in addition to all of his white ticking he does have rather unique facial markings. Is the page restricted in some way? It shouldn't be. I'll double check the settings. How do you embed a picture here? swale1984 wrote: It shouldn't be. I'll double check the settings. How do you embed a picture here? The easiest way I've found is upload a pic to a site like Photobucket, then click/copy the "direct link" in the menu of embedding choices you're given. Then, paste that link in the comment box, highlight it and click the IMG button above the comment box to wrap it with the image coding. I'm sure he is much lighter now (this was taken 4 years ago), but I'd never seen a grey/roan with a mane that color before. He got it honestly though...he was by Buddha and his distaff side is full of greys/roans as well. I love the star/blaze on this horse's face. I would have named him Bolt. It's "The Horse That Lived"!